Syrian government forces backed by Lebanon's Hezbollah took almost full control of a town just outside Damascus from Islamist rebels on Thursday, a pro-opposition monitoring group said, a blow to the rebels who had held it for more than a year. 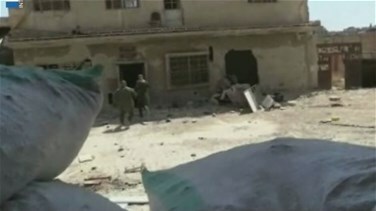 Syrian state television also reported big progress for government forces in the town of Mleiha, which lies on the edge of the eastern Ghouta region near Damascus airport and has been surrounded by President Bashar al-Assad's forces. Mleiha, about 7 km (4 miles) from the heart of Damascus, has formed a base for rebel fighters who have used it as a position from which to bombard the capital with mortars. "Units from the army and the armed forces continue their operations in Mleiha ... and are achieving qualitative progress, and liquidating a large number of terrorists and pursuing what is left of them in farms north of the town," state TV said in a scrolling headline. There was no way to independently confirm the report. Government forces have pushed back the rebels around Damascus with help from Hezbollah, and consolidated Assad's grip over central Syria and along the border with Lebanon. To watch Rima Assaf's report, please click on the video above.